What does he have to do with King Arthur? Post apocalypse traffic cop Tarzan enforcing the traffic law regarding one way streets. Look, you’d feel stabby too if your head had been grafted directly to your right shoulder, so let’s all cut the feller some slack. Also, I hope that’s not the death machine behind him, because it looks like a freshman BFA art installation left out over winter break. I would have gone with something other than the wedding-invitation font. Well, the distinct lack of ting rules out barbarbarian superman so I suppose it must be the other one then. THX: Not the same Ted White as created the image of “Camelot” around the Kennedy White House. But apparently there is or was a Theodore E. White who had something to do with “the development of zooarchaeology in North America”. So now you know. And that kind of looks appropriate for the cover. Maybe the “Death Machine” is that thing you can vaguely see in the background. Regardless, still not picking up major title-synchronization from this cover. This is clearly a school play called ‘Son of a Gun’ fed through the Babelfish English-to-English translator when they did the posters. @Frank: All of the above. @Hover text: That’s what I thought. @Lillie Awesome: living up to your name. That font… I suppose it could be more inappropriate to the title, art, tagline, premise, but I’m not sure how. That’s a 70’s romance font, that is. Back to supervising the oven in which pumpkin pie is baking. After his death defying 100-foot dive from the top of the art installation, the Great Tarzini demonstrates his most astounding feat of all—placing his head into the gaping jaws of this horrifying title and, someday, perhaps, withdrawing it—unscathed! 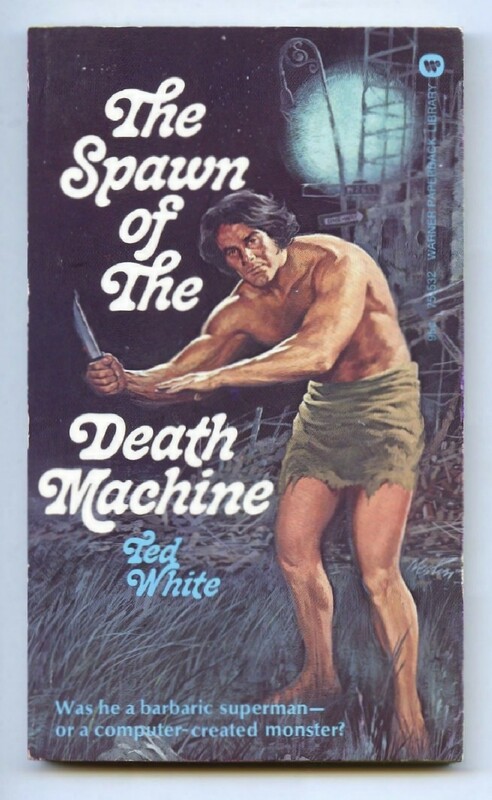 The Death Machine is badly disappointed in its spawn’s life choices. (And he never calls, either).